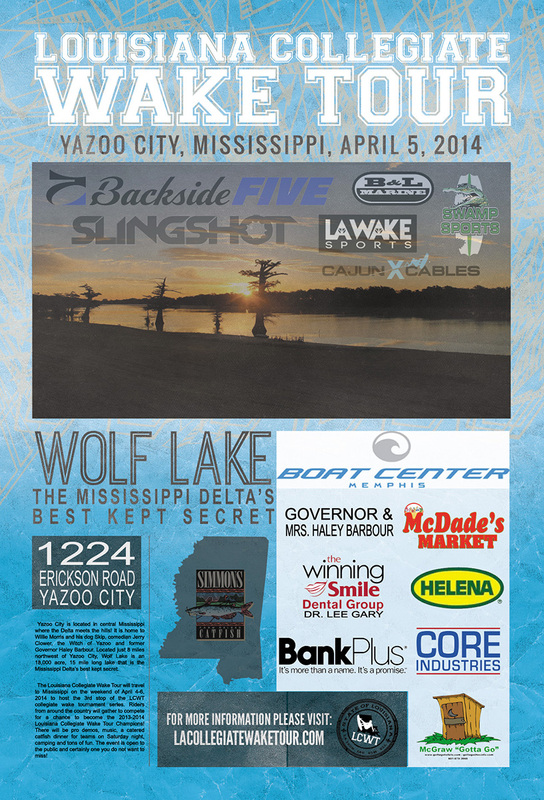 Louisiana Collegiate Wake Tour coming to Yazoo City in April! Home → Past Events → Louisiana Collegiate Wake Tour coming to Yazoo City in April! Wolf Lake Event a FIRST for LCWT! Located just 8 miles northwest of Yazoo City, Wolf Lake is an 18,000 acre, 15 mile-long lake that is the Mississippi Delta’s best kept secret. The Louisiana Collegiate Wake Tour traveled outside of their home state for the first time, heading to Wolf Lake on the weekend of April 4 – 6, 2014, the 3rd stop of the LCWT tournament series. Riders from around the country gathered to compete for a chance to be come the 2013-2014 Louisiana Collegiate Wake Tour Champions! The public was encouraged to attend on Saturday, April 5, as pro demos, music, camping and tons of fun converged on Wolf Lake at 1224 Erickson Road, Yazoo City. The event brought teams from Louisiana, Mississippi, and even Michigan to our area. A great time was had by all, and Wolf Lake was said to be one of the best locations they have ever experienced. Event sponsors: Grand Patron, Bank Plus, Haley and Marsha Barbour, Kirk and Kim Erickson, Lee Gary, DMD at The Winning Smile Group, Core Industries, Helena Chemical, McGraw Gotta-Go Portables, Simmons Catfish, McDade’s Markets, MS Sports Medicine & Orthopedic Center, Yazoo County Convention and Visitors Bureau. Tour sponsors: Memphis Boat Center, Backside Five, Bennett’s Water Ski & Wakeboard School, LA Wake Sports, B&L Marine, Swamp Sports, and Slingshot Wakeboards.